This is a pictue of the two saunas that were placed at Dr. Mike and Brenda's family home in Raceland. Over 100 individuals underwent treatment at the "Detox Center," and the vast majority of these patients experienced remarkable improvement in their illnesses. The glass jars on the top of the saunas were labeled and given to each of the new patients. 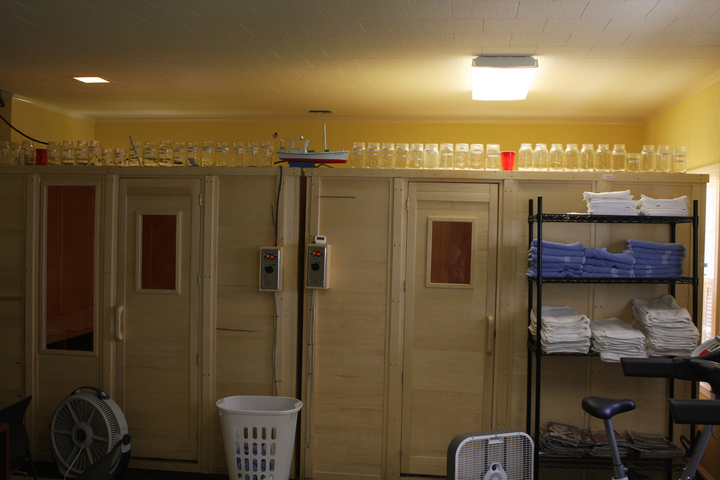 When the patient completed his or her treatment cycle, each of the jars was placed at the top of the saunas. By the time the program was completed, there were two rows of jars representing the 100+ patients that were treated at the site. We'll write more about the treatment center when time permits.